Museum Founder, Harry E. Percival, Jr.
Harry Percival is the one man who can be most credited with founding the WW&F Museum, even though he would be quick to deny that he was our founder. Nevertheless, it was Harry who laid the groundwork for the present day museum, many years before the museum came to be. 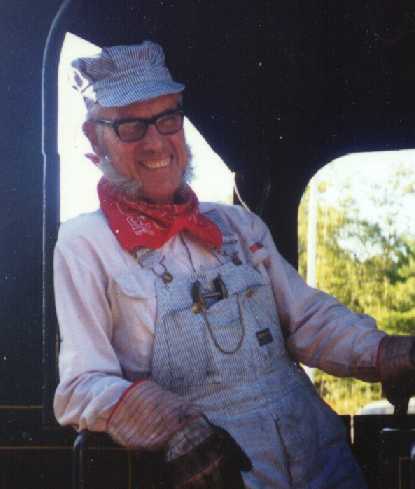 Harry E. Percival, Jr., doing what he loved, working on trains. For many of Harry’s formative years, he lived alongside the WW&F’s right-of-way, in Head Tide and in Weeks Mills, but after the mainline rails had been lifted, with sidings still around until after the US entry into World War 2. He played on the abandoned ties, and attempted to “rebuild” the line using timbers from his father’s wood pile. His father soon discovered where his missing timbers went and ended that attempt. Harry went off to serve in the Army in Europe, and returned to Maine to become educated, get married and start a family, and became an electrical engineer for Central Maine Power Company. Yet the desire to rebuild the WW&F never left him, even in adulthood. The steps to begin the restoration of the WW&F began with trips to the Ramsdell farm in Connecticut in the 1970s. The farm was the home of the WW&F’s only remaining locomotive, flatcar, and one of two remaining boxcars. He began to do maintenance on the equipment, but recalls that he would end up doing more farmwork than anything else. However these yearly visits earned the trust of owner Alice Ramsdell. The turning point came in 1985, when Harry was able to purchase all of the WW&F’s remaining assets from the Winter Scientific Institutes, a non-profit organization set up by WW&F owner Frank Winters to avoid property taxes for the railroad land. Harry had tried before in the early 1970s, but had been rebuffed. For a few thousand dollars, he now owned approximately 60% of the right-of-way, spread out like Morse Code between Wiscasset and Albion. With WW&F assets now in hand, Harry learned from the State that the Wiscasset and Quebec Railroad Company, which was the name of the original company, had never been formally disbanded. All it would take to restart the company would be to have a stockholders meeting and elect officers, and the original corporation would be back in business. He persuaded some friends to buy stock, and held an election. He himself acquired quite a bit of W&Q stock from his WW&F purchase. Harry also owned some land in Alna, adjacent to a portion of the right-of-way that he owned, which he decided would become the new home any restoration efforts. He deeded this portion of land over the W&Q Railroad Company, to act as landlord. He found more people interested in starting a preservation organization, and the group which ultimately became the WW&F Railway Museum was born. At this time, Harry’s friendship with Alice Ramsdell paid off. She allowed the remnants of Flatcar 118 to return to Maine – but, there had to be a caretaker near the Museum to keep an eye on things. Harry therefore began building his last house next to the Museum’s property. Harry died of cancer in late 2001. Harry’s dream had begun really small – all he wanted was to have the train appear from the north, stop at the station, and disappear to the south, on the other side of Cross Road. Harry lived to see his dream take off and blossom more than he could have envisioned.